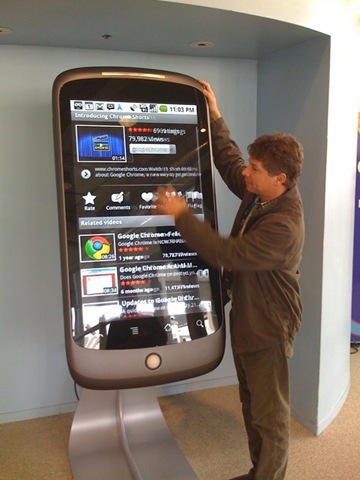 Here is a nice video of world’s largest Google Nexus One Phone!. This video already viewed by 2,39,561 when I’m writing this post. World largest nexus one phone built by Google itself, you cannot keep this phone in your pocket because it’s too big, and note that it’s not an working version, it’s just for demo purpose and it controlled by MAC mini running windows. Google’s known for its cool lobby toys. 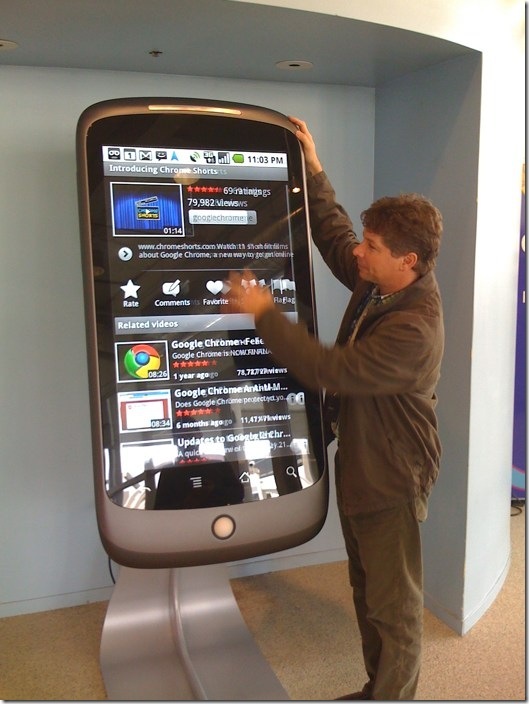 Now it has a new one — a giant version of the Nexus One Android phone. No, it’s not an actual working version. But the video display simulates what the phone does, and it even has a realistic-looking camera and ports. Under the hood, there’s a Mac Mini running Windows to make the magic happen. In the video, a tour from Search Engine Land editor in chief Danny Sullivan and the head of Google’s web spam team — and Nexus One longtime user — Matt Cutts. Thanks for search engine land for providing this video. What you think about this phone? Do you want it? Similar : Google replayed to Steve Jobs! woo..! It is great. Thanks buddy for sharing this.